Chicago DJ Equipment Online Superstore - KORG DJ, STUDIO & PRODUCTION EQUIPMENT AT THE LOWEST PRICES! KAOSS DJ isn’t just a DJ controller and effects processor. It also features a USB audio interface with inputs and outputs, providing even more performance possibilities. With audio, MIDI and effects features, KAOSS DJ is a complete DJ solution! A synthesizer that lets you generate your own personal sound, packing a cutting-edge sound engine and powerful effects into a compact, vintage-like body. 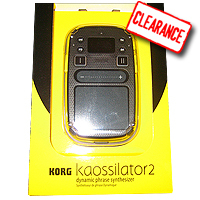 Boasting a supercharged sound generator, Kaossilator 2 delivers excellent synth and drum sounds spanning a wide range of genres, plus dramatically expanded loop recording.